The President started his first term with rallies of "hope,""change," and "Yes We Can." He seems to be ending his second term with something along the lines of, "c'mon people.. just trust me." The latest media campaign from the President's Office is begging us to believe in the guy. Despite the whole propaganda-esque production, is there some truth to this? After all, President Obama is a lame duck at this point, and with all eyes on 2016 - it would be nice if he could get some things done before the 8 year limit kicks him out of the door to the White House. Then again, isn't our government founded - to some degree - on the right to be cynical? Cynical - believing that people are generally selfish and dishonest. "It is time to provide a smashing answer for those cynical men who say that a Democracy cannot be honest and efficient. The irony in those words is that we need cynics to keep Democracy honest and efficient. Without anyone questioning our politicians, who would hold them accountable? And there's a lot to question right now. The reaction to Gaza, inaction in Syria, airstrikes in Iraq, lack of leadership on immigration - are we supposed to take the President's word on these topics, without uttering a cynical sentence that expresses our disappointments? There are, without doubt, times when our government has been "selfish" and "dishonest." It's our responsibility to keep that in check. If the President wants to beg for our approval, that's fine. 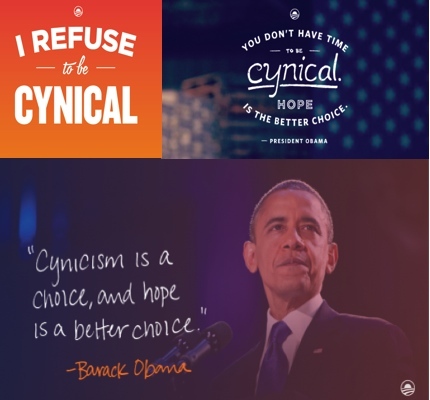 But maybe we be a bit less cynical he'd stop telling us to be less cynical.